To remove memory modules, or RAM, from a laptop, you follow very similar steps from one brand to another; today, nearly every laptop design places an access panel on the bottom of the laptop and uses similarly latching sockets. The description used here is for the Toshiba Satellite P205 laptop. Turn off the computer using the Windows shut-down process. Keep in mind that you lose stored data if you use Sleep or Hibernation mode. Unplug the AC adapter cable that runs to the laptop. Why remove the AC adapter and the battery before removing memory modules? First of all, plugging them in while power is on could result in damage to the RAM. Secondly, doing any work on a laptop while power is applied could result in a damaging spark. Disconnect any other cabling to the laptop, including an Ethernet cable or a telephone modem wire. If the laptop has been running recently, allow it to cool for about 15 minutes; memory modules can become quite hot when they are in use. Locate a small Phillips-head screwdriver. This is the screwdriver with an X-shaped head. Place a soft cloth or other protective mat on a desktop. Turn the laptop over so that its bottom is facing up. Locate the memory module slot cover. Credit: Courtesy of Toshiba America, Inc. 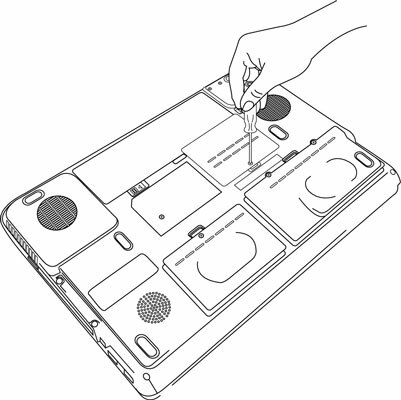 The illustration above shows the proper technique for removing the memory module slot cover on the bottom of a laptop. 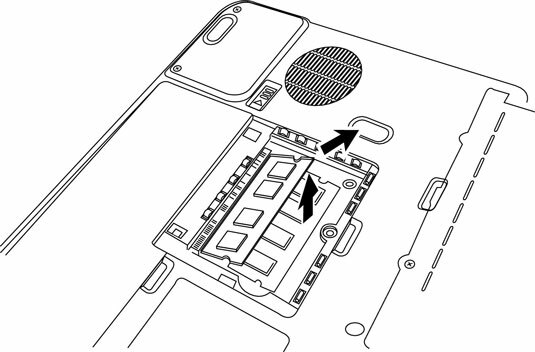 Carefully remove the screw that holds the cover over the memory compartment. Hold the screwdriver at a right angle to the bottom of the laptop and turn the screw carefully; it shouldn’t require a lot of force to remove. Once the screw is removed, put it in a safe place. Use a piece of clear tape to attach it to the desktop or the side of the computer. Ground yourself before touching the memory module. Touch any grounded metal surface, like a light stand, or touch the center screw on an electrical outlet. Carefully release the latches on the side of the module holder. Lift it to an approximately 30-degree angle from the bottom surface of the laptop. Gently slide the module out of its connector and out of the slot. Lift up the memory module holder and remove the memory. Turn the laptop right side up. Reattach the AC adapter cable and other connections.